Kuppai Matters: How much plastic waste, which brand? As a small group of volunteers walked though the snaking pathway that led through Urur Kuppam to the stretch of Elliot’s beach near the Broken Bridge, we spotted litter through the trek. There were styrofoam cups, packing material, plastic covers, PET bottles and pieces of glass strewn along the path. 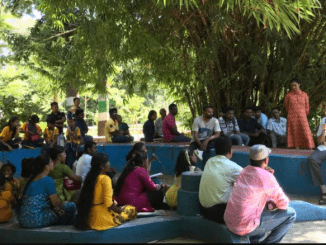 We were headed towards the shoreline by the bridge to collect waste for the Waste and Brand Audit, a pan-India initiative that was led by the Kuppai Matters platform in Chennai last Saturday. When we made our way past the bridge to the designated spot, Olaf, a German exchange student who worked with Vettiver Collective remarked that the area was marginally cleaner than it had been the last time he had come by. 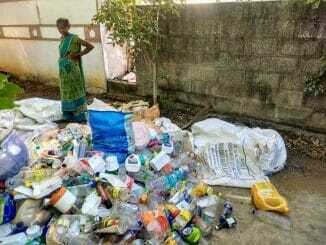 The rest of the party were surprised at his remark as all around were Aavin milk packets, Britannia Milk Bikis wrappers, Tata Gluco energy drink cups, Saravana Bhavan plastic covers and other assorted waste material. Over the course of the next two hours, the collection in the small area by thirteen volunteers yielded seven sacks of waste. 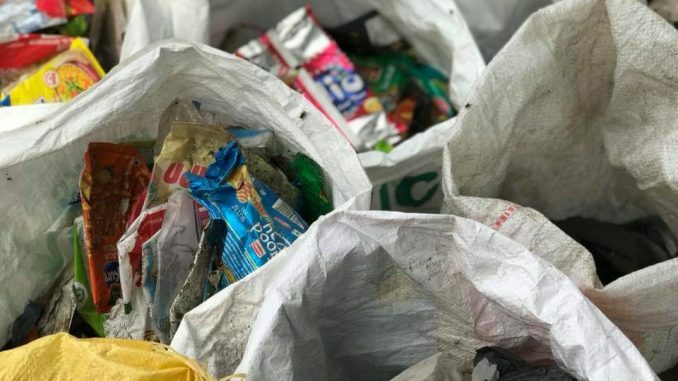 The items collected were segregated into bags of branded plastic, unbranded plastic, glass and metal, polystyrene and rubber. The effort involved the Citizen consumer and civic Action Group (CAG), Arappor Iyakkam, Vettiver Collective and the Chennai Trekking Club. Citizen Matters is also a partner in the initiative. With little recourse and poor enforcement of existing rules, environmental organisations have come together for the Break Free From Plastic movement comprising 1060 groups world-wide, to highlight the menace of plastic and pin responsibility on its producers responsible. While beach cleanups and spot fixes have been a regular fixture in cities over the last few years, the ambit of such initiatives must extend beyond awareness on part of the consumer. Brand audits provide an avenue to shift the discourse on plastic waste from the consumer to the producer. The audit saw not just volunteers from Kuppai Matters but citizens and groups that were actively working to improve the state of waste management in the city. The conversation veered towards what are the possible measures that can be taken to hold the brands accountable. While there was some scepticism about taking billion dollar multi-national companies to task over their damaging practices, the consensus was that this was collectively a critical time for citizens across the globe to act. Citizen Matters has partnered with CAG for the Kuppai Matters initiative.